Mathilde Blais was knocked off her bicycle at around 6:30 a.m. on April 28, 2014, while traveling southbound on St-Denis, and was run over by the truck. About 20 per cent of cyclist deaths in the city is due to truck collisions. 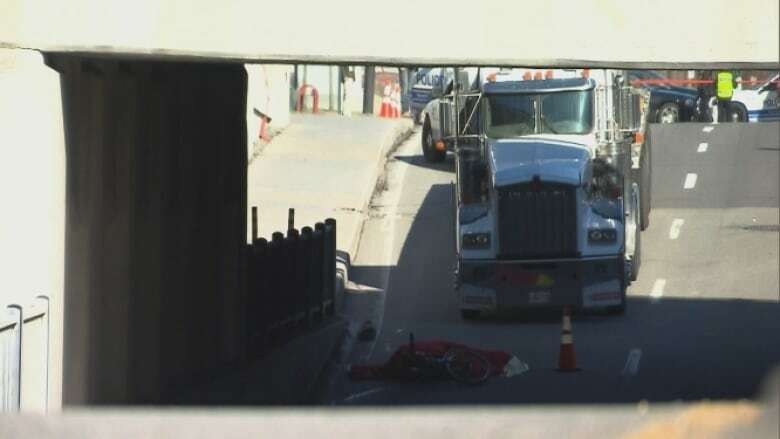 At least a fifth of all cycling deaths in Montreal since 2005 are caused by collisions with heavy trucks and tractor-trailers, data obtained from Quebec’s coroner shows. CBC News obtained coroner’s reports for 59 cyclist deaths in Montreal from 2005 to 2016, though complete sets of reports were not yet available from 2015 onwards. 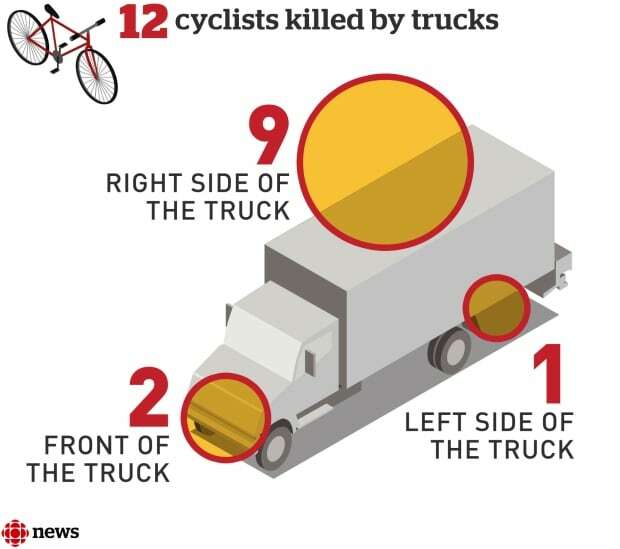 The reports showed that 12 cyclists were killed in collisions with trucks during that time, 10 of whom were drawn under the wheels of the trucks and crushed. In five of those deaths, the truck driver was turning and may not have seen the cyclist. Two cyclists were struck by the front of the truck. There have been at least two additional cyclist deaths due to collisions with trucks in Montreal in 2017, but coroner’s reports are not yet available. 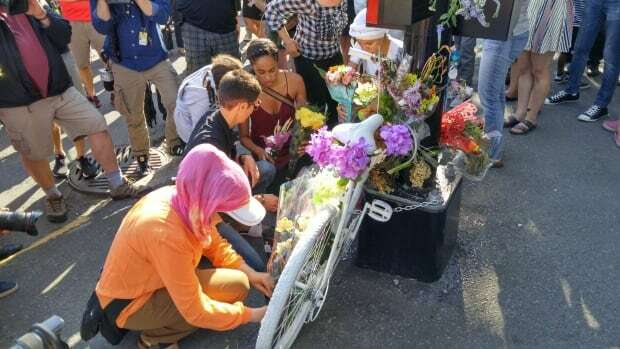 The death of 41-year-old Meryem Ânoun in July, one of the year’s two collision deaths involving trucks, renewed calls from cycling groups to do more to regulate trucks on city streets after she was struck by a truck turning right at the intersection of Bélanger and 6th Avenue. “Everybody, every step of government, has the power to act on this issue which causes terrible deaths,” said Laurent Deslauriers with Ghost Bikes Montreal, a group which puts up white ghost bikes at the sites of fatal cycling accidents. For a city with a huge number of active cyclists, about six people on average are killed while riding their bikes every year. Men were much more likely to die than women — 49 men have died, compared to just 10 women since 2005. Cyclists are still most likely to die as a result of a collision with a car, accounting for 52 per cent of the deaths analyzed by CBC. But when cyclists are hit by trucks, the collisions are often horrific. Cyclists are vulnerable because they are smaller and have so much less power compared to heavy machinery, and helmets don’t offer much if any, protection in a collision. The collisions are preventable and these horrific deaths shouldn’t be happening, according to one borough mayor. “As public officials, we should be taking every measure within our control, to make sure that we can prevent these accidents from happening,” said Saint-Laurent borough Mayor Alan DeSousa. In 2012, the borough decided to make side guards mandatory on trucks and heavy vehicles. Side guards are barriers located between the front and back wheels to keep pedestrians and cyclists from being drawn underneath. “It’s a preventative measure, it’s something that improves public safety,” he said. The borough retrofitted its existing fleet over three years and all new trucks are required to have the guards. “Every life saved is worth it, every injury prevented is worth it, and that’s how you build a safe community,” said DeSousa. Since then, the City of Montreal has installed side guards on city trucks, but those rules don’t apply to private trucks, as that regulation that would need to come from Transport Canada. Federal Transport Minister Marc Garneau announced a task force in September 2016 to looks at ways to reduce cyclist and pedestrian deaths from heavy trucks. According to an email to CBC News from ministry spokesperson Marie-Anyk Côté, Transport Canada is currently testing sensors that can help drivers detect pedestrians and cyclists at a motor vehicle test center Blainville, Que. The results of that testing should be available later this year, while the task force is expected to report its findings in the spring of 2018. For Deslauriers though, a sensor will never replace direct eye contact between drivers and cyclists. In the meantime, ► Jeannette Holman-Price has started a petition to ask the federal transport minister to amend the Motor Vehicle Safety Act to make sure all trucks built or imported to Canada are equipped with side guards. Holman-Price’s daughter, Jessica, was killed in 2005 when she fell under a city snow removal truck in Westmount. Mona Fortier, the Ottawa-Vanier Liberal MP who is sponsoring the petition, said the issue hit close to home for her. For cyclists like Deslauriers, sideguards aren’t the best way to solve the problem, they’re merely a temporary solution. Ghost Bikes Montreal is calling for Montreal to ban unsafe trucks with significant blind spots from the city streets. The idea is based on a plan from Transport for London, the transportation authority for London, England. 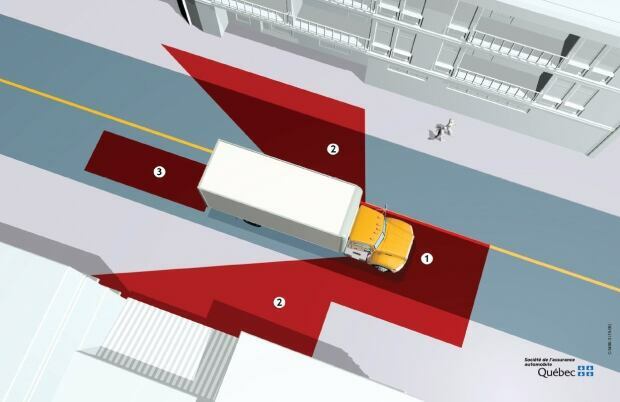 Under the plan, trucks would be given a safety rating between zero and five, based on how easily drivers can see cyclists and pedestrians directly, without the help of mirrors. Trucks that have poor visibility are given low ratings, and would eventually be phased out. The City of Montreal said it is considering the idea. Meanwhile, Montreal police are working to educate drivers and cyclists about staying out of blind spots. Insp. Vincent Richer with the SPVM’s traffic division said the force will actually demonstrate a truck’s blind spots to people outside the truck. “We actually take a truck and we put on the ground the zone where the driver can’t see the cyclist,” he said.